workshop organized by the Image Permanence Institute (IPI) and sponsored by a National Endowment for the Humanities grant. The first day of this workshop addressed the question of “what you need to know to define an optimal and sustainable preservation environment.” The second day of the workshop provided information for achieving an optimal and sustainable environment. What is an optimal and sustainable preservation environment? developed by the IPI re-frames the process of developing a good museum climate. According to the IPI, “an optimal preservation environment is one that achieves the best possible preservation of collections at the least possible consumption of energy, and is sustainable over time.” This happens when “your unique climate control system consistently produces its own best possible storage environment at the least possible consumption of energy.” Instead of thinking about optimizing as something that requires the purchase of new equipment, the IPI presents optimization as something relevant to what you already have. Step 1: What is your system? What types of collections do you have? What is the local environment of your institution? What is your building envelope? What is your HVAC system capable of and how does it work? What HVAC system serves which space(s)? Step 2: What is your system doing? temperature and relative humidity of the space can be completed with dataloggers. Only once the building plan is understood can the decisions about where to place dataloggers be made. The data can then be analyzed using software and compared with the expected climate. expected and the reality are often areas of learning and/or cost savings. 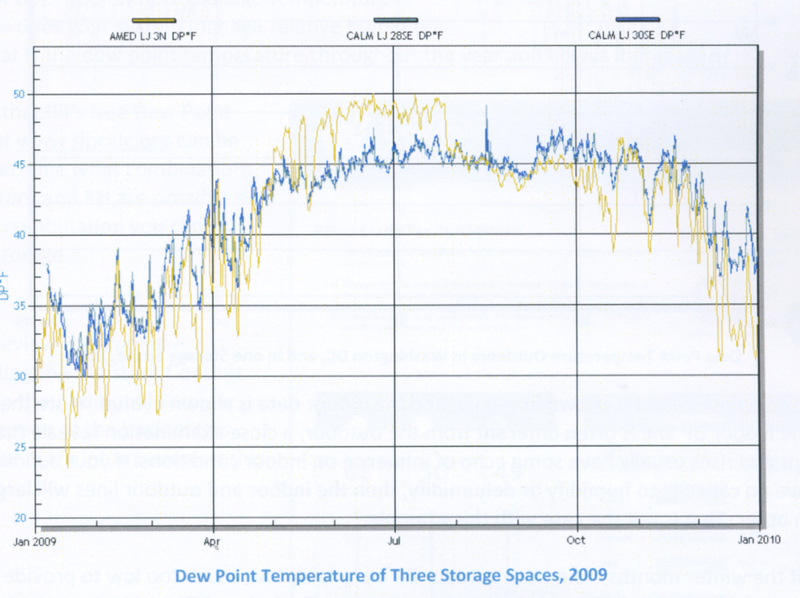 This image of the data for a storage space suggests that two rooms are on the same HVAC system but the third is not. the IPI’s preservation metrics to interpret and manage climate data. Preservation metrics are helpful because they transform data into meaningful conclusions using standardized and reproducible processes. The metrics can also enable quick comparison of data between different rooms and can help to measure progress towards a better climate. procedure for monitoring the environment has been running for a year, the process of experimentation can begin. Experimentation is only as good as the documentation that accompanies it – if you don’t know what you changed, you won’t know if it worked! The goal for experimentation is to figure how to achieve an optimal environment. As discussed above, an optimal environment is when “your unique climate control system consistently produces its own best possible storage environment at the least possible consumption of energy.” Therefore, when experimenting, one thing to investigate is whether the climate control system is using more energy than necessary. As Peter Herzog said, “excess energy consumption is not self announcing” – you have to look for it. However, the search for energy savings can only occur after understanding the current system and how it is actually performing. 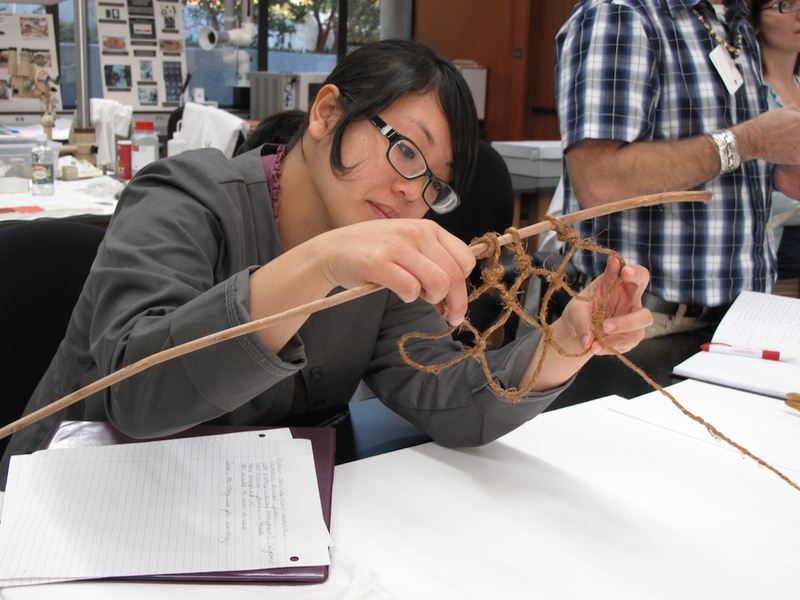 The workshop by the IPI was very informative, well-paced and appropriate for both conservators and facilities managers. If it is offered again in the future, I recommend attending! Alternatively, the PowerPoint’s and resources from the workshop will be available at the website (http://ipisustainability.org). All the information and images came from the Image Permanence Institute’s Sustainable Preservation Practices for Managing Storage Environments workshop and seminar reference book. 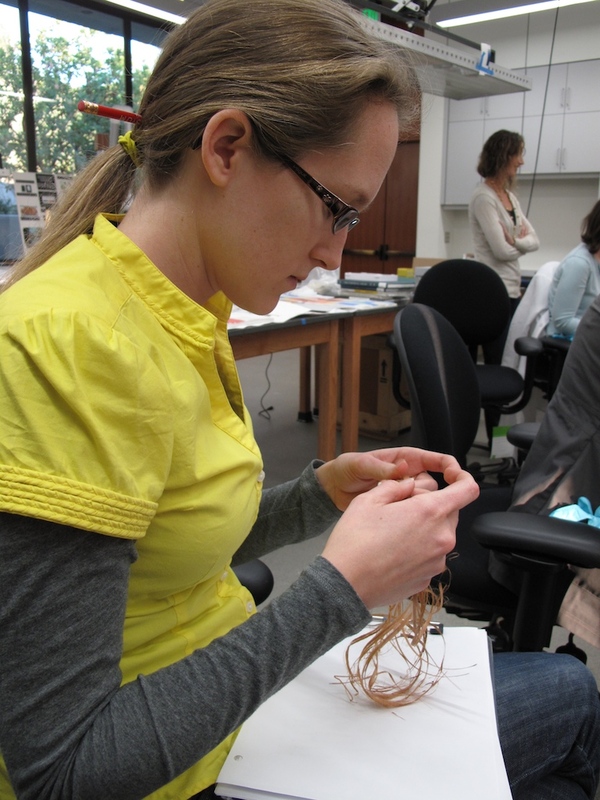 The workshop was held at UCLA in Los Angeles, CA from April 26-27, 2011. Categories: Sustainable Preservation Environment, Workshop | Tags: HVAC, Image Permanence Institute, relative humidity, sustainable preservation environment, temperature | Permalink. 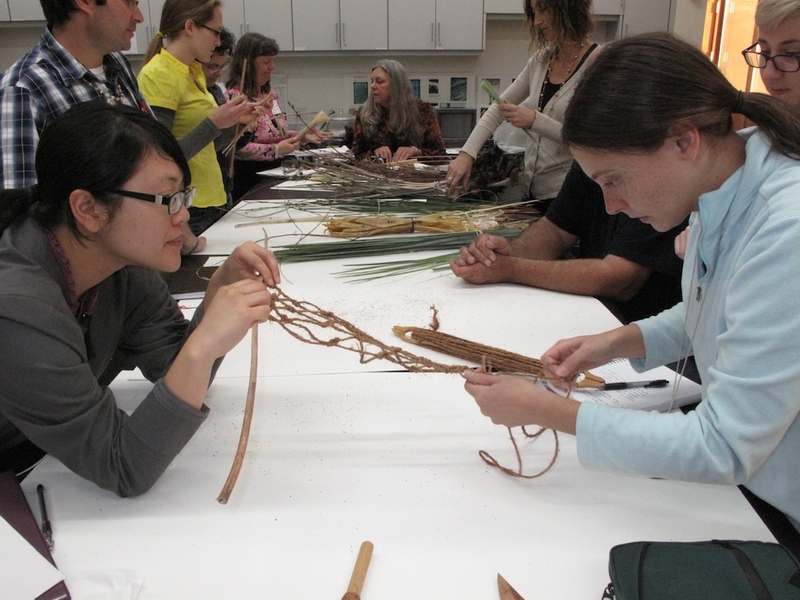 Several weeks after the students visited the museum in Palm Springs, Dawn Wellman and Sean Milanovich came to the Getty Villa to discuss basket-making techniques and the pieces the students were working on. 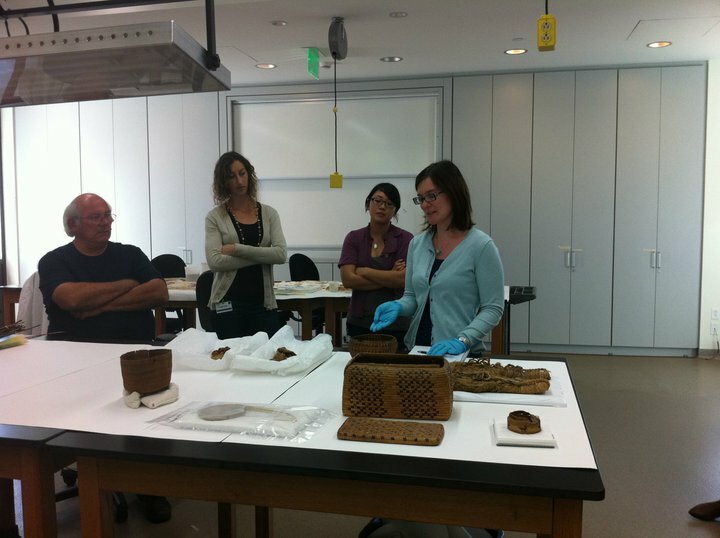 Several other guests, including native basketry expert William Pink, former UCLA/Getty student Molly Gleeson, and independent curator Bryn Potter, also offered their expertise. The morning began with a talk from Molly regarding her work in Alaska with baskets in museums and with local weavers. Several of the students found this information particularly helpful, as they were working with pieces from the Northwest Coast region. Molly presented a fascinating overview of her work, which included gathering local materials, speaking with local weavers, creating her own twined basket, and treating a variety of pieces at several different institutions. Following the talk, the students and visitors shared lunch, before heading up to the laboratory to discuss the baskets. Students talked individually about each of the pieces they were working on, sharing information they had uncovered regarding the technology, condition, and cultural attribution of each of the objects. Dawn Wellman (curator at ACCM), Sean Milanovich (Cultural Specialist, Agua Caliente Band of Cahuilla Indians), Bryn Potter (Curator and basketry expert), William Pink (Luiseño and native basketry expert), and Molly Gleeson all participated in the discussion, and shared their thoughts with the students regarding each of the pieces. This exchange of information was valuable for all parties involved. The students shared information discovered through technical examination and research, which was then further informed by the knowledge the visitors had to offer. 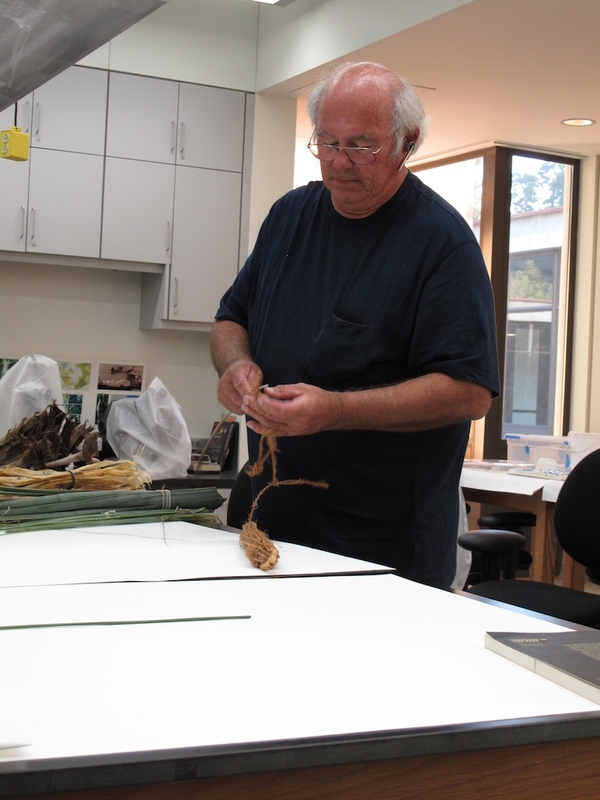 Following discussion of the pieces from the Agua Caliente Cultural Museum, Willie Pink did a variety of presentations for the class, showcasing the use of traditional plant materials from the area. 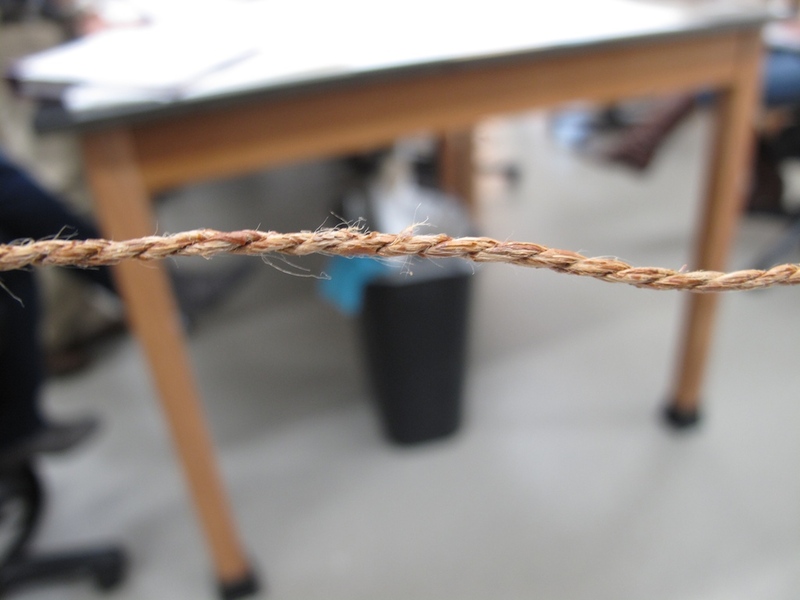 This was particularly interesting for one of the students, who was working on a pair of fiber sandals that might have been created from processed yucca fiber. 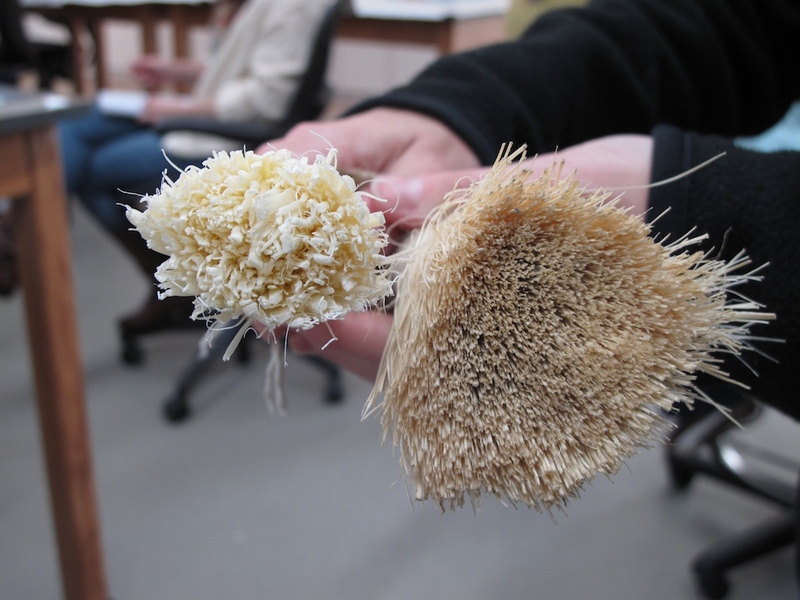 Following the presentation, some students also had the chance to create yucca brushes themselves. 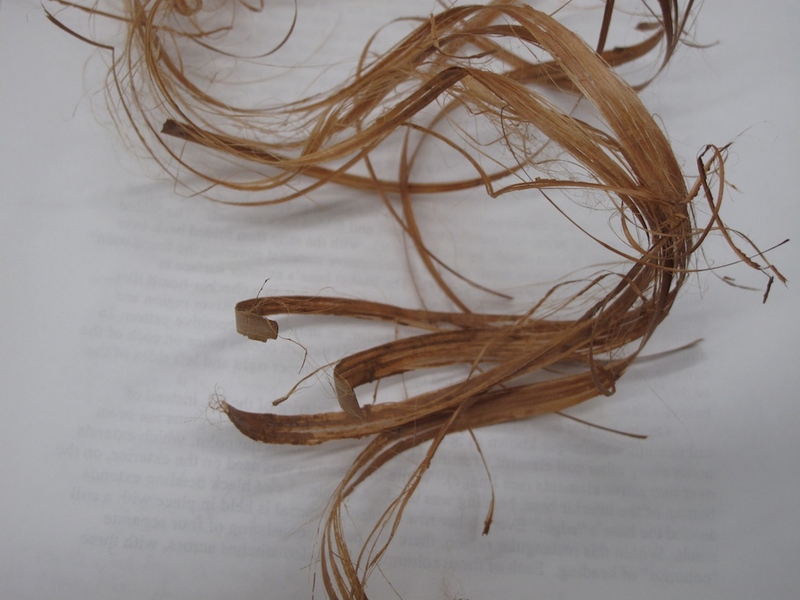 Again, this provided an important understanding of the processing of elements and the processes involved in constructing objects made of these fiber elements. 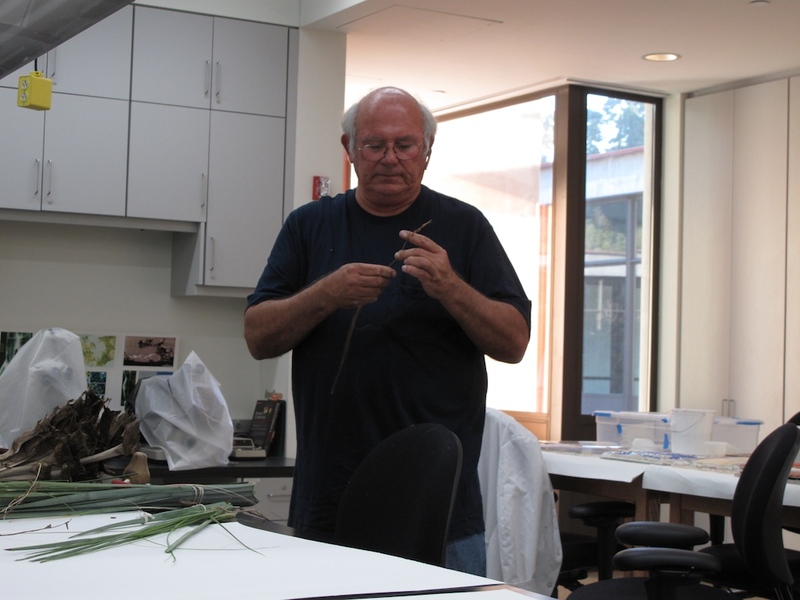 After showing the students how dogbane is split, processed, and twined into cordage, Willie showed demonstrated making netting out of dogbane as well. 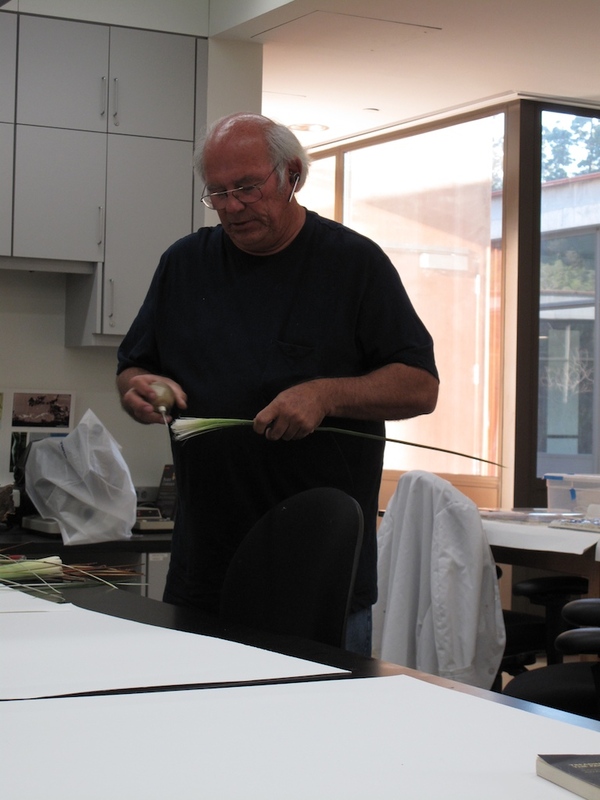 Following Willie’s presentation, students had a chance to use plant materials and try their hand at some of the techniques that Willie had demonstrated. Each of the students was eager to contribute links to the dogbane net! 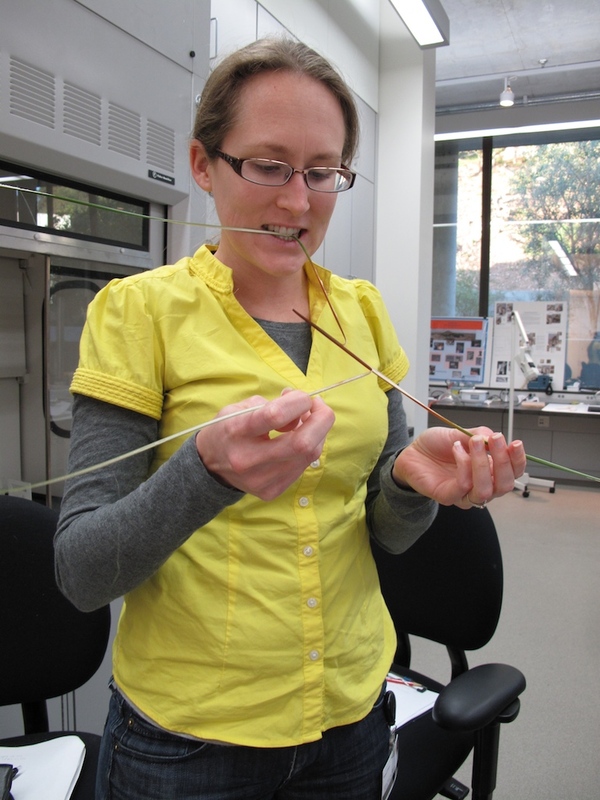 Here, Robin splits juncus with her teeth, a technique that can be quite difficult for a first-timer! 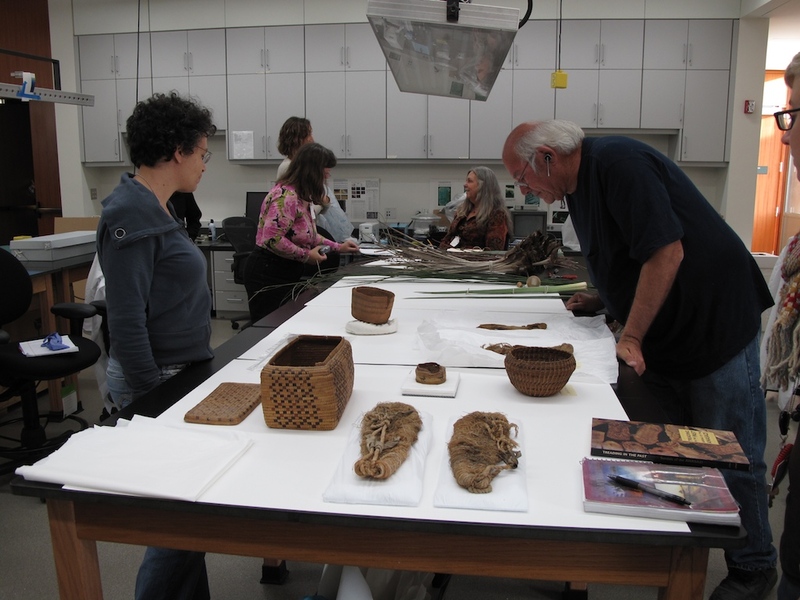 Categories: Conservation and Ethnography, Courses | Tags: ACCM, agave, baskets, dogbane, juncus | Permalink.